From farm gate to dinner plate, grass-fed beef has been generating plenty of buzz. That it's easier than grain on the cattle, the environment, and human health appears to be a matter of fact. Regardless of the label under which cattle end, their journey begins as calves sent out to graze in pastures or open range lands. Weaned when grass and forage become their primary food source, an early plant-based diet is common to all beef cattle. The path to either a grass- or grain-fed distinction changes if this diet is supplemented with grain products as calves mature. When these cattle approach their mature market weight, grain rations increase, and grass-feeding gives way to a several month period of "finishing" on grain only. Most notable in considering the grass versus grain debate on animal health is the fact the cattle are ruminants, and specifically designed to break down grass foods. With a multi-stomach system best suited to the digestion of roughage(grass), excess grain consumption can be highly problematic for ruminants. As such, a going concern in grain fed herds is the occurrence of ruminal acidosis, whereby the first stomach chamber becomes excessively acidic. Depending on severity, acidosis can range from mildly irritating to a painful, debilitating condition resulting in death. Of the many treatments and prevention options for acidosis, the routine use of antibiotics is common practice in the feedlot food supply chain. Grass-fed: All cattle initially subsist on grass and plants foraged from pasture or open range lands. Only those animals that live out their entire lives eating a plant-based diet produce 100 per cent grass-fed beef. Grain Finished: Occurs when cattle are brought in from grazing on pasture and switched to a grain diet in the months leading up to their slaughter. This finishing period occurs on a feedlot but may also take place on the animals' home farm. Natural beef: Does not refer to organic beef but is commonly used to describe cattle raised on pasture and range lands and without the use of anti-biotics or growth hormones. These cattle may either be finished on grain products or continue a plant-based diet until slaughter. Free-range: A loose term traditionally referring to open, unfenced livestock grazing. 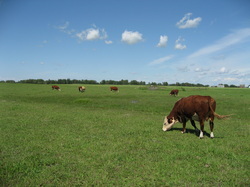 In marketing language, free-range is commonly used to describe the roaming condition of cattle without reference to diet or finishing method. In order to clarify the labelling of your beef, a discussion with your farmer or butcher should be the first order of business. Important questions include the diet of the cattle, their living conditions from birth to slaughter, and whether they were finished on grain.